Tis the season to be jolly, tra la la la la ….. and all that. I chose dates for the December challenge because they seemed suitably festive, but oh what to make? Should I stuff madjool dates with walnuts and dip them in chocolate, make a cake, biscuits, cupcakes or those wonderful date slices I’ve been coveting since first seeing them on Suelle’s blog? I know, I’ll make all of those – hmmmm. Reality set in and I realised I had very few non working days before Christmas and rather too much to do. So, I’ve gone for a cake and if I have time I might have a go at some of the others. Again, it was a cake I’d seen on Mainly Baking that inspired this one, Dan Lepard’s Hazenut Prune Cake. I was initially going to substitute the dates for the prunes and try and follow the recipe to the letter. As it happened, I had some walnuts that really needed using up, so it turned into something different again. I substituted the nutmeg for mace and added some orange for an extra festive note. The mix itself, I found rather too dry, so I also added some orange juice. Having made some candied orange peel, which I will blog about at some future date, I had quite a bit of orange syrup going free to a good home – a good home was found. And finally, I wanted to make the cake more chocolatey, it is after all a chocolate challenge – a datey chocolate ganache found its way onto the top of the cake. So once again, my version bares little resemblance to the original, but it’s the inspiration that counts. I’ll stop this stream of consciousness now and get on with the recipe. Creamed together 100g unsalted butter with 100g dark muscovado sugar and 1 heaped tbsp of golden syrup until pale and fluffy. Beat in 2 duck eggs, one after the other and the zest of 1 orange. Sifted in 125g flour (100g wholemeal, 25g white), 1 tsp baking powder, a pinch of bicarb of soda, 1/2 tsp ground mace and 1 tbsp cocoa. Stirred in the juice of 1 orange. Mixed n 300g chopped dates and 100g chopped walnuts. Spooned into a 23cm silicone mould and smoothed the top down. Baked at 180C for 35 minutes. Whilst cake was hot, poured over 3-4 tbsp of orange syrup left over from making candied orange peel, then left to cool. Melted 100g chocolate (50g milk & 50g Maya Gold), 25g unsalted butter, 2 tbsp date syrup and 1 tbsp orange syrup. 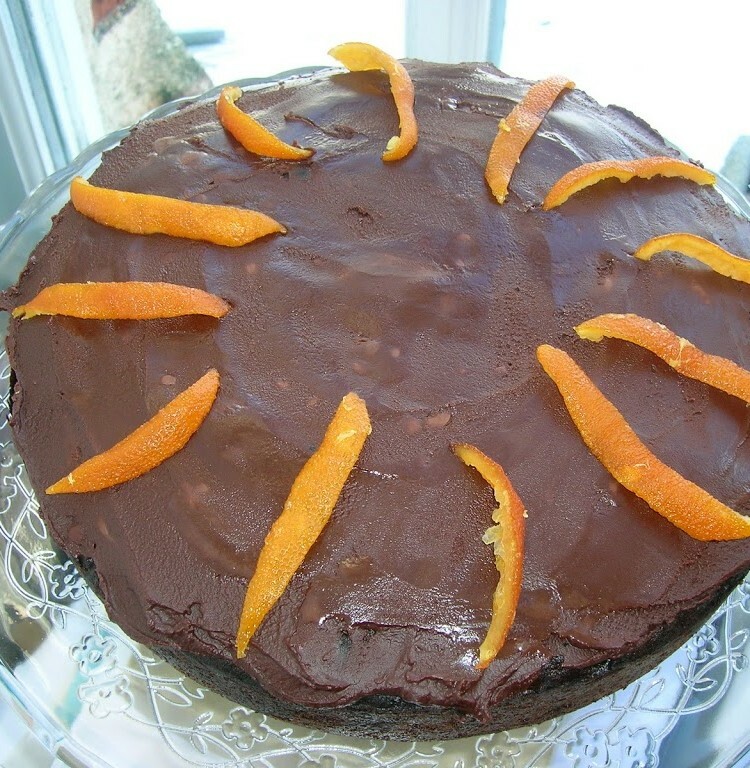 Decorated with candied orange peel. PS – this cake was not only moist and very tasty but kept well for weeks. That’s an interesting version of the cake. Did the dates become soft and sticky when cooked? They are so much harder than prunes that it’s difficult to see them as a good substitute. I was worried that the mixture was too dry when I made this cake, but trusted Dan’s skills and it baked to a really light texture. Oooh, you’ve hit a fine run of form coming up to Christmas. These are my favourite posts of yours: the ones where you’ve got a big pile of something sweet and sticky. Merry Christmas ! Best wishes! Suelle – hope you had a good Christmas. The dates were fine, they softened up nicely. I do like the sound of the original prune cake, but this worked well I thought (although I’ve had enough of dates for the time being)! VegBoxBoy – thank you for the good wishes. What I have, is a pile of posts that need to be written! Hope you had a good Christmas. Chele – thank you. I know dates are not your favourite. Hope you enjoyed and are continuing to enjoy Christmas. Dom – nice one – now I can’t get rid of the image of your head being buried in my cake. Hope you’re enjoying the festivities. Raffaella – thank you. Hope you are having a good time too. Oxslip – think you are probably right there. Hope you’re enjoying Christmas. Celia – thank you. The flavour of the rinds was delicious, but I over dried them, so they were a bit chewy. Joanna – thank you. No trains for a while – hoorah! And I seem to be doing a fair bit of chocolate consumption 🙂 Hope you’re having a good Christmas. BVG – thanks – hope you’re having a good Christmas too. MangoCheeks – thank you and I hope you are at least enjoying a well deserved break from work. Definitely looks festive. Happy belated Christmas! I have to admit I don’t like dates but was excited to try a date brownie for the challenge but unfortunately ran out of time as I was ill then had to catch up with Christmas baking. Looking forward to Jan’s challenge!